Based on the memoir by Eliot Ness and Oscar Fraley, The Untouchables is the story of a group of police officers and detectives who try to take down Al Capone during the Prohibition era. Directed by Brian de Palma and screenplay by David Mamet, the film is a look into the formation of this group led by Ness as it is set in 1930 Chicago with Kevin Costner playing the role of Ness. Also starring Robert de Niro, Charles Martin Smith, Andy Garcia, Patricia Clarkson, Billy Drago, and Sean Connery. The Untouchables is a thrilling and mesmerizing film from Brian de Palma. Set in 1930 Chicago during the era of Prohibition where Al Capone (Robert de Niro) ruled the city and created havoc, the film revolves around Eliot Ness and his team of incorruptible men who are willing to take down Capone by any means while bringing him to justice. It’s a film that is a dramatized take on the events where Ness arrives into the city as an outsider for the treasury department as his early attempts to shut down Capone is met with embarrassment. 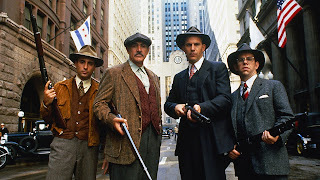 Upon meeting an Irish beat cop in Jimmy Malone (Sean Connery), Ness learns that he can’t trust the police as he teams up with Malone as well as an academy trainee in George Stone (Andy Garcia) and a bureau accountant in Oscar Wallace (Charles Martin Smith) to stop Capone and get evidence over the unpaid taxes that were never recorded. The film’s screenplay by David Mamet doesn’t just explore the conflict between Capone and the Untouchables but also what is at stake. Notably as one of the early scenes in the film involves a bombing at a neighborhood where a young girl dies which forces Ness to really do something where he later meets that girl’s mother. Being a family man himself, Ness realizes he must do what he can to protect his wife and children from being killed as he is eventually targeted following a series of successful raids. It’s among the elements that Mamet does which gives some gravitas to the story as well as creating characters that are very engaging where Malone is a man that had seen it all and believes that Ness is the man that is willing to bring order back to the world. Stone is an Italian-American who is a great marksman and is street-smart as he is someone that wants to change the perception of what people think of Italians despite the fact that he changed his name. Wallace is just a simple accountant who is crucial to the team as he would make some discoveries into Capone’s finances as well as see what businesses he is linked to. Then there’s Capone as he is this loose cannon that barks orders as well as be someone that thrives being in power. 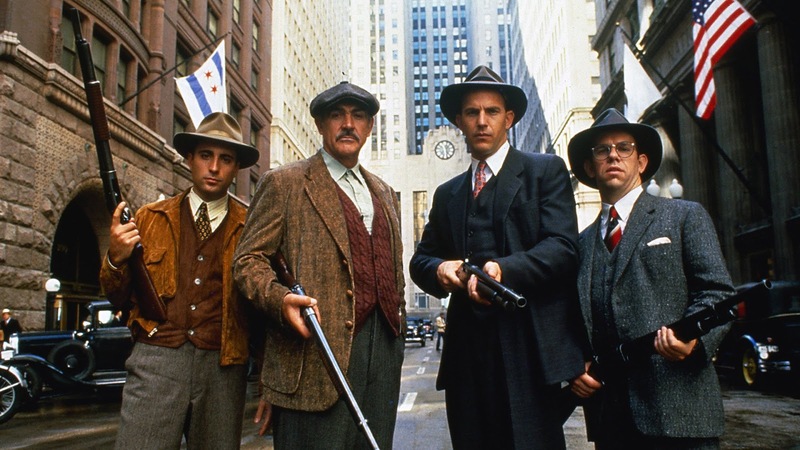 Through monologues written by Mamet, it adds a sense of iconography into Capone as a man who has this idea that he owns Chicago and believes he will take over the world. It definitely adds a lot into the conflict where Mamet’s script manages to play up this sort of rise-and-fall scenario on Capone in the hands of Ness and the Untouchables but the third act also reveals exactly what happens when Capone gets pushed into the edge and will do anything to keep his empire afloat. Brian de Palma’s direction is definitely entrancing in terms of not just the visuals he creates but also in the fact that he goes for a lot of style to play up the world of 1930s Chicago as he would shoot the film on location in the city. From the usage of overhead shots to open the film where Capone is getting a shave, a manicure, and a shoe shine to the intricate usage of crane shots and close-ups. The direction of de Palma is always filled with some sense of technical wizardry in how he would put his actors into a frame such as a church conversation where Ness is in the foreground and Malone is in the background in one shot and then cut to a medium shot of the two with the camera in front of them. The sense of intimacy in de Palma’s usage of close-ups and medium shots add to the camaraderie between Ness, Malone, Stone, and Wallace in their pursuit to bring order. The direction also has some very unique touches that does pay ode to elements of cinema such a key sequence at the Chicago train station which pays homage to the Odessa steps sequence from Battleship Potemkin. It adds to the sense of drama and what is at stake where it is clear that Ness isn’t just trying to do good for Chicago but also to make sure that the little girl who was killed by a bomb would find peace. Even as it leads to Capone being put on trial where there is still an element of suspense in its climax about the idea on if justice will be served or will Capone buy his way out of the jail sentence. It all plays part into the dangerous world that is 1930s Chicago and the era of Prohibition that has caused so much violence all because people wanted to drink alcohol with Ness needing to uphold the law the best way he can to keep people safe. Overall, de Palma crafts a very lavish yet gripping film about a lawman’s war against Al Capone. Cinematographer Stephen H. Burum does excellent work with the film‘s cinematography from the lavish usage of lights to play up the high-class lifestyle that Capone lives in to the usage of more naturalistic yet low-key lights for the more simple lifestyle of Ness and the Untouchables live in. Editors Gerald B. Greenberg and Bill Pankow do amazing work with the editing with its stylish usage of jump-cuts and slow-motion cuts that play into the drama and action that occurs in the film along with some very offbeat rhythms for the suspenseful moments. Art director William A. Elliot, with set decorators Patrizia von Brandenstein and Hal Gausman, does fantastic work with the set pieces from the look of the Livingston hotel and the suites that Capone lives in to some of the factories where some of the bootlegging occurs. Costume designer Marilyn Vance does brilliant work with the costumes from street clothes and uniforms some of the cops wear as well as the suits that Capone wears which are designed by Giorgio Armani. Makeup artist Michael Hancock and hair stylist Bette Iverson do nice work with some of the minimal makeup for the look of Al Capone as well as the hairstyle that women sported during those times. Sound editor Dan Sable does superb work with the sound to create some sound effects for some of the darker moments in the film as well as the elements of suspense. The film’s music by Ennio Morricone is incredible for its mixture of bombastic orchestral textures and offbeat themes to play into some of the humor and drama as it is really among one of the finest scores ever while music supervisor Emile Charlap brings in the music of Duke Ellington and other jazz pieces of the times to play into that period. The casting by Lyn Stalmaster and Mali Finn is remarkable as it features some notable small roles from Clifton James as a district attorney, Richard Bradford as the police chief Mike Dorsett who reluctantly helps Ness early on as he‘s an old friend of Malone, Jack Kehoe as Capone’s bookkeeper Walter Payne, Brad Sullivan as one of Capone’s associates named George who gets captured by the Untouchables and the Mounties in Canada, Billy Drago as Capone’s key cleaner Frank Nitti, and Patricia Clarkson in a small but wonderful performance as Ness’ wife. Charles Martin Smith is excellent as Oscar Wallace as an accountant for the bureau who helps Ness in uncovering many of Capone’s finance as he becomes part of the Untouchables as someone that isn’t afraid to carry a shotgun. Andy Garcia is fantastic as George Stone as an Italian-American who uses a fake name in order to hide his real name out of fear of prejudice yet proves to be a skilled marksman and be loyal to what Ness wants to do. Robert de Niro is brilliant as Al Capone where de Niro brings a lot of charm and smarminess to the role as well as being very violent and full of bravado as he definitely makes Capone larger than life. Sean Connery is amazing as Jimmy Malone as this Irish beat cop who had seen a lot as he helps Ness in bringing down Capone while realizing many of the bad things that is happening where he goes to some great extremes to get answers as it’s Connery in one of his best roles ever. Finally, there’s Kevin Costner in a marvelous performance as Eliot Ness as a treasury department agent who is tasked to bring Capone down as well as do what he needs to protect his family and make sure that the people of Chicago will feel safe. The Untouchables is a phenomenal film from Brian de Palma. Featuring a great cast led by Kevin Costner, Sean Connery, and Robert de Niro as well as compelling script by David Mamet, lavish visuals, and Ennio Morricone’s thrilling score. The film isn’t just one of the finest films of the gangster film genre but also a mesmerizing film that plays into the world of law and order vs. crime. In the end, The Untouchables is a sensational film from Brian de Palma. This is an absolutely brilliant film. I love everything about it and it's one of my all time faves. De Niro is great, plus this easily my favorite Sean Connery performance. I just cansay enough good things about this film. It's been a while since I saw this but I LOVED this film! Such a great story, wonderful cast and something you can revisit time and again. It could be one of Connery's best work but I love Costner here as well. I forgot the script was Mamet's no wonder it was so good! @Wendell-This is a classic film all the way. While I think de Palma has a few films that were much better, this is an example when he's given good material to work with. He'll be great. As for Connery, I much prefer The Hunt for Red October as my favorite performance from Connery, outside of James Bond. @ruth-I decided to revisit it and man, it still holds up. I love everything about it from the sense of style to the cast itself. I can't find any faults with it. @jwforeva-You're welcome. This is among one of the essential films of the gangster/Prohibition era. Now, this IS what I'm talking about! What a great film and even more exceptional when you consider it was one De Palma's "paycheck" movies. Not bad! He really makes the material so dynamic with all of the wonderful camerawork. Just incredible. This is one of those films where if I happen to catch it partway through on TV, I end up watching the rest of it. @J.D. Lafrance-If this is considered a paycheck film of his, it's a damn good one as I just love how he infuses it with so much style and bring a lot of weight to what is at stake.